I've just returned from a lovely summer holiday in the South of France. The local farmer's market in Antibes was bursting with an array of seasonal produce. Luckily I was on a self catering break so had the chance to cook with lots of these ingredients. 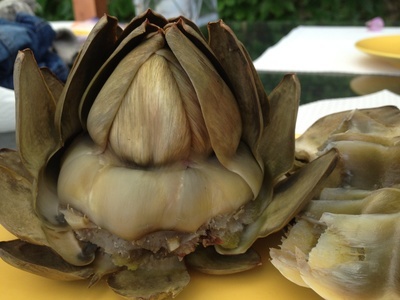 I've only ever had artichoke hearts from a deli counter and never prepared, cooked and eaten them from scratch. It was a revelation and so simple to do that I wanted to share. 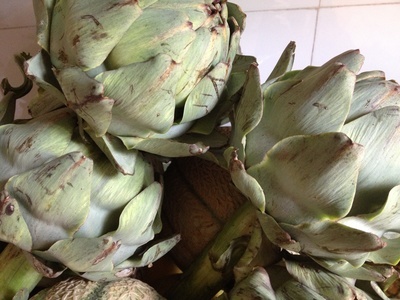 Boil the artichokes whole, in a pan of water with a little lemon juice. It will take about 45 mins and the outer leaves will start to pull away easily. Place on a plate and you can start eating straight away. Gently pull off each leaf. Holding the tip, place in your mouth and pull the fleshy end through your teeth. There's only a little in each leaf. They taste great dipped in a little warm Parmesan butter sauce. 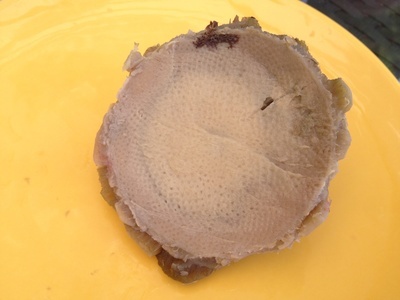 Once you have devoured the outer leave, grab the top and remove. 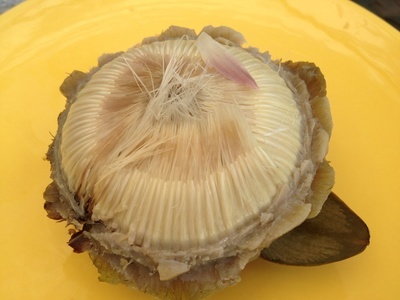 It's a little furry underneath, so scrape this off with a knife and you'll be left with the artichoke heart beneath. Slice it up and eat as it is. 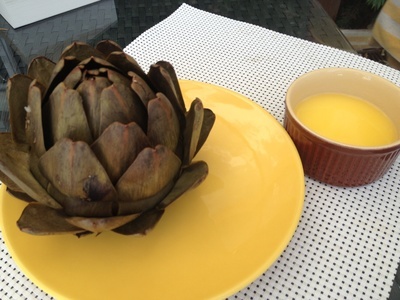 Artichokes might not look the prettiest but they make a delicious starter on a summer's day.